In today’s world, authenticity is no longer an option for brands. Successful entities understand that their customers and stakeholders expect them to reflect societal values in exchange for their business patronage. Join us as we welcome Joel Payne, vice president of corporate communications for MWWPR, as he reveals how today’s growing demographic of “CorpSumers” are acting as highly engaged consumers as well as brand loyalists, activists and advocates for companies that do the right thing. This influential segment of society is now over 90-million strong in the US – rivaling Moms and Millennials in size and cutting across key demographics from Generation Z to Baby Boomers. Their sway is being felt in how companies behave across issues including sustainability, politics and employee welfare. Meeting the expectations of this population is critical for brands to flourish now and in the years to come. At this program, Joel will discuss this phenomenon and how businesses are aligning their communications efforts internally and externally to meet the demands of these new expectations. Joel Payne is a public relations strategist and political commentator. He’s currently a vice president with MWWPR’s Corporate Communications practice. 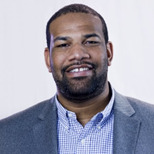 Joel served as the director of African-American paid media for Hillary for America during the 2016 general election campaign. Joel has also served as deputy press secretary for then-Senate Majority Leader Harry Reid, a role in which he was the primary staff writer for the Senate Democratic Caucus during the 111th Congress, and he also previously served as communications director for Congresswoman Barbara Lee. He frequently appears on television and radio as a political analyst on MSNBC, CNN, FOX News, FOX Business among other outlets. Joel served as a political contributor for CBS News during the 2018 midterms. Joel is a graduate of Brown University. Herb-roasted chicken with chef’s choice of sides and veggies, warm rolls and chocolate cake for dessert. A choice of salad, with or without meat, is also available. Make your selection when registering, and be sure to pick up your salad ticket upon checking in for the luncheon if you choose that option.